Having a special party for a girl's 16th birthday is a fun tradition for many families but it doesn't require a large guest list. Plan a memorable party with just a few close friends and family. 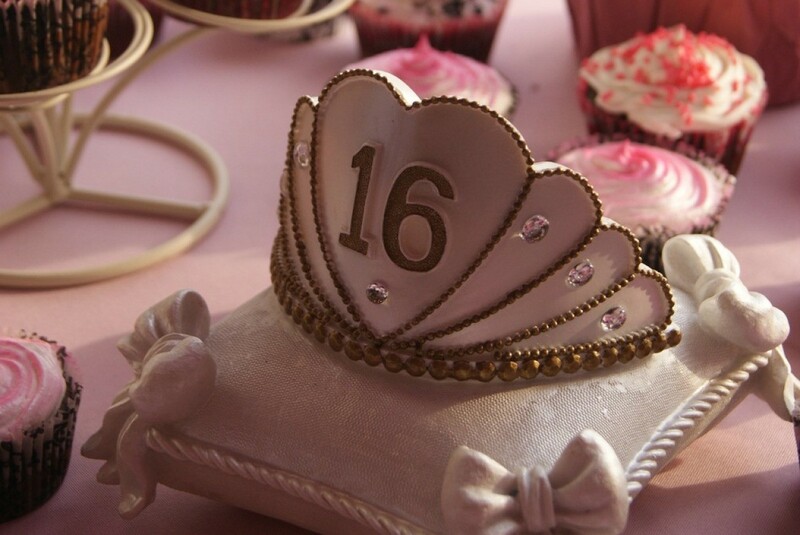 This guide contains ideas for planning a small Sweet Sixteen birthday. 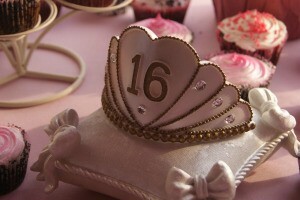 I am planning my daughter's Sweet Sixteen and trying to come up with some themes. Does anyone have any ideas? I don't have a theme for you, except maybe a pampering party with a hilarious twist! Then I was 12 we had a party and all the girls applied makeup to each other. The catch is... the one applying the makeup is blindfolded! Take turns until everyone has been made over then take pictures together! So funny. Another idea to go along with the theme... buy cheap nail polish and set up teams. They paint each team mates fingernails/toenails with their NON-writing hand!Make homemade avocado face masks too. Making messes is fun! I know they would have a huge blast with these activities! Everyone can come over and lounge in their PJs. As the mother of seven, four of which are girls, I have thrown more than my share of parties. Each of my girls have very different ideas, hobbies, and passions. So the party themes are varied as well. Please keep in mind that I do not pick a theme on short notice and I am always looking for new and different ideas. Planning and fore thought make for the most successful parties. The longer you have to plan, the cheaper the event. The following ten ideas have been tried and have all been repeated by others in our area. The greatest flatter is when someone else host a party with your original theme. Raid the closets of your family and friends for old prom, bridesmaids, formals, and gowns. Thrift stores often have them for a few dollars. It is best to have at least three or four per girl. Various sizes and styles make for a more exciting fashion show. You will also need a great deal of safety pins and hundreds of bobby pins. When the girls arrive let them go crazy trying on all the dresses. Some will require privacy to change. Once the gowns have been selected, the hair salon opens. Let the girls do each others hair. Once the hair is in place which generally takes an hour, make up is applied. I highly suggest that you not have heels for the girls to wear. Someone can get hurt. Plus the tennis shoes they have on, add to the look. You could have a limo take the girls to a movie or a restaurant once the proper look has been achieved. But a limo is not needed. Everyone looks and stares at the girls in their finery. The girls will love the attention. Wraps, boas, and old mink stoles add to the glamor. When you arrive back home, let the girls do a fashion show to strut their stuff. Dancing is often done after the show. One year, we even had corsages for all of them. They all had a flower to take home as a keep sake. The girls are greeted at the door with a good-bye and thanks for attending the party. All clothes must be turned wrong side out or worn backwards. The dining room chairs are placed on the table, and the tablecloth is on the floor under the table. The cake and plates are on the floor. The girls eat the ice cream and cake first and then sing happy birthday. Gifts are opened next. Make sure the birthday girl thanks each person before she opens the gift. Games are played. Do immature younger games, but play them backwards. After games, the girls will change into their pajamas, backwards or course. While the girls watch a movie, fix them breakfast food. Served under the table of course. In the morning, serve chips and soda pop for breakfast. Added bonus, you do not have to deal with the sugar rush, their parents do. When it is time to leave. Welcome the girls with a hello and how wonderful they look. Since you have not seen them in forever. We write the invitation backwards to get the party started right. I write on cheap rolling pins from the dollar store for the invitations. Tie ribbons on the ends for flair. I collect ugly aprons from thrift stores and garage sales for this event. I also collect paper chef hats. When the kids arrive, have them each make their own pizza dough. It will need time to rise. While the dough is getting ready have several bowls of white icing ready. Let the kids use food coloring to make several different colors with the white icing. Make sure each child gets to make a color. Have at least three cupcakes per child made before the party begins. Now let the kids pat out the dough, make crust, apply sauce, cheese, and toppings for their very own creation. They will use three times the amount of cheese that is needed, so stock up or explain that less is more. While the pizza pies are cooking, have them decorate their cupcakes. After the pizzas have been admired and eaten, the real fun begins. Take number 10 cans with lids, have each child measure out the cream, sugar, and mix in a three pound coffee can with lid. Insert the three can into the ten can. Add ice, and salt. The kids will then spend the next hour to hour and a half rolling the cans back and forth to make ice cream. Driveway or uncarpeted room is perfect for this. The ice cream and cupcakes are the highlight of the event. We do this together as one party, but only one can prove to be as awesome as well. When the kids arrive they draw a number. We have team 1 and team 2. Each group will need an adult chaperon. Each team starts with a pen. They go from one house to another in your neighborhood asking for something bigger. But they can only trade up once at a single house. For example: they trade the pen for a comb, the comb for a brush, the brush for a stuffed animal, the animal for a roll of paper towels, the towels, for a bucket, etc. The teams have one hour to get the biggest item. It will amaze you at how much fun the neighbors have helping and what they trade for. One team brought back an old ten speed bike and the other a two wheeled cart. The winning team must serve the losing team ice cream and cake. Let the kids rest and open gifts. Now it is off to the mall. Once again, teams are drawn. Each team is given a list of 50 things that they need to scavenger for. The lists must be the same items and one paper sack to hold their items. Each team has an adult chaperon. They can ask people walking in the mall, people working in stores, etc. Each team has an hour to collect the most items. The bags are collected and it is the perfect time to watch a movie at the mall or go home to watch a movie. The items are counted in front of all the kids when you arrive home and a winner is declared. The winners must make the popcorn, chips, and drinks for the losing team. Items on the list can include a paper clip, green stamp, a milk jug lid, straight pin, gas receipt, stamp, Q-tip, etc. Make sure the items are small and hard to find. This party theme is a huge hit with the pre teen set. I buy any and all beads, craft jewelry, old unique jewelry for the pieces, costume jewelry pieces, and craft sets. I only buy at thrift stores, garage sales, and the after Christmas sales for this items. Cross stitch yarn is a must and can be bought on clearance at all fabric stores. The girls make necklaces, bracelets, and rings for themselves and for the birthday girl. Friendship bracelets take hours to make and the girls can watch movies while they make their unique color designs. Collect shower caps for this event. Most hotels will give you a dozen if you ask nicely. The things you will needs on hand are: cotton balls, nail polish in many colors, cuticle sticks, nail polish remover, cucumber, oatmeal, honey, bath salts, nail files, scented lotions, dish soap, small bowls, and large pans for soaking feet, flip flops, and fabric strips. Pour dish soap is small bowls for the girls to soak their fingernails in. Have them do this at the table so they can talk together as they soak. Show them how to correct and push back their cuticles. Have them paint each others finger nails. Cake and ice cream before you soak their feet in bath salts. The birthday girl can open gifts in front of them as they soak. Now it is time to fill their toes with cotton balls and paint their own toe nails. Scented lotions should be applied now. Flip flops can be purchased in September from Old Navy, Gap, Rue 21, etc. for 50 cents to a dollar. Buy most in your daughters size and a few larger and smaller. Have the girls make designer flip flops in their school colors. Have them cut stripes of fabric and tie knots to make a personal pair for each to wear and show off their pretty toe nails. Pajamas are now put on and the shower caps are dawned. Have the girls make their own facial cream. I use oatmeal and honey. As the girls get comfortable for a movie, have them each lay down and put cucumbers on their eyes. This reduces puffy eyes and makes the girls tired. They laugh and talk for a few minutes and by twenty minutes they are fighting not to go to sleep. Time for them to put on their facial masks and watch a movie. Twenty to thirty minutes later, let them wash the dried mask off. They can do each others hair as they finish the movie. In the morning, rave about how wonderful they all look. Messy, fun, and the kids get to make their own creations. I buy ugly long sleeve men's shirts at garage sales for the kids to wear over their clothes. Have four or five art projects ready. Sidewalk chalk gets a great mural started on your driveway and starts their creative juices flowing. We have painted flower pots, birdhouses, wooden bins, piggy banks, and even glass vases. Whatever you can find that all match and are not expensive. Brushes can be bought at the dollar store. In April you can find plain sweatshirts for a dollar at Wal-Mart. Buy them in various sizes and try to get them all the same color. Iron double sided instant hem on the back of a floral fabric that matches the sweatshirt before the party. Letter stencils will help the girls draw and cut out their own names in the fabric. After you have ironed their names on the sweatshirts, have the girls use puff paint to outline the letters. Hint: the girls must use the puff paint on the shirts in a place where the shirts will not be moved till in the morning. It takes several hours for the puff paint to dry. Buy flat sheets at garage sales. They become perfect canvases for the kids to paint on. Finger painting is also fun. Buy face paint at costume shops and mass merchandisers after Halloween. After the girls have painted their own portrait for the birthday girl as a keep sake, have them go crazy painting their own faces, and each others. They will laugh till they cry. When the kids arrive have them draw numbers for two different teams. Explain to them that they are going to make the world a better place in the next few hours. Ask each one to think of one way that they could make the world a better place. Have them write it down on a piece of paper and collect them. Explain that helping others can be fun and make them feel better about themselves. To prove it, they are going to see which team can collect the most canned goods to feed those less fortunate. The winning team will get a prize. As the teams are getting ready to leave with a chaperone, that has an empty trunk for all the food they collect, dare them to take it a step further. Tell them that you are not sure if they can do two things at once. Show them a single plastic shopping bag and ask them if they know what it is made out of. Some will be surprised to find out it is made of plastic or oil and even both sometimes. Explain to them that those bags that their groceries come home in, are filling up our dumps and hurting the environment. Dare them to see which team can collect the most bags as well. Find a local food bank ahead of time that the kids can give the food to. Set up a time for them to meet you. Have them praise the kids and tell them how many people they will feed with the food they collected. If your party starts at 2. The kids should collect from 2:30 to 3:30. Set up a 4 o'clock appointment for the kids to help deliver the food. The arrange for the kids to take all the plastic bags to a recycling center. If one is not available or open at that time. Have them take then to a not-for-profit resale shop to be reused. Be sure that the kids know the name of the food bank they are collecting for. You can even print a small flyer with the name of the food bank on it and ask for people to help their cause. You can get 10 on a single piece of paper for them to hand out at the door. After the teams have collected and delivered their good deeds it is back to the birthday girls house. They will all be hungry and tired. After cake and food, read the ways they can help the world, that they wrote when they arrived. Tell them how proud you are of them and all that they have done. We have made fleece blankets for nursing homes with the knot ties, drawn get well cards for those at the hospital, letters to soldiers over seas, and once we collected money for a local child with cancer. They raised over a hundred dollars going door to door in an hour. You would have though it was a million by the look of pride on their faces. Go to older persons garage sales and old thrift stores for the clothes. The uglier the better. It is disco time. You can not have enough polyester. Large wigs are a great hit. Have them watch John Travolta shake his stuff in Saturday Night Fever. Teach them how to do the hustle. Dance to the Bee Gees and Donna Summers. It is a laid back theme that the kids love. Have the kids come in costume, no matter what time of the year. Each one has a sports uniform, old Halloween costume, dance recital costume, or parents old clothes to wear. When they arrive have each one state exactly whom they are in costume of. It cannot be just a foot ball player, it must be a specific player. The other kids must call them by their characters name from that point on, plus they must talk, act, and do what their character would do at all times. Then take them out for a fun evening. Go out to dinner, a movie, miniature golf, etc. They must stay in character the whole evening. Accents are a perfect addition to the charade. The kids will get tons of attention where ever they go. It is a winner every time. These ideas can be done easily and cheaply if planned in advance. My children must have their theme by their half birthdays each year. It is their day and it should be celebrated. To make it more memorable, take tons of pictures. Plus, make sure all siblings are not a part of the event. A sitter or grandparent can take them during the party. Make your child feel like the only person in the world that day. Give them all of your attention. That is the best gift of all. Don't worry if it is not perfect. Accidents will happen, something will break, and your carpet is going to get stained. Just smile at your child and remember that they are what is important. The other things can be replaced, but your child can not. Now, let's party! I will be turning 16 soon and I have no idea what to do. I want to have a great party. I'm only inviting like 8-10 friends, so it can't be too big. We are all around the same age, and I want to do something memorable for all of us. My birthday is in March so the weather should be good. Please if anyone has any good ideas, or even just a theme to base my party on? Help! Go to a spa. Get your nails and toes done! Go bowling. Go for frozen yogurt. We just had my daughter's Sweet 16 party.. it was on a larger scale. She did a "glow party" with glow sticks, necklaces, cups and anything that glowed in the dark. It was pretty cool and everyone had fun. The dollar stores usually have glow sticks... a few for a dollar. Just a suggestion. I am not a person who tends to invite a lot of people because I feel more comfortable only with my close friends. So I need an idea of what to do during a birthday party with around five people. It is during January so I guess that means cold weather. I'm living in Canada and I only want a small sweet 16. The thing is I turn 16 on the 18th of this month. I normally only invite one friend to my party and the rest is family. Please help; I'm lost for ideas. I'm going to be turning 16 at the end of February and I have no idea what to do! I want it to be a sweet sixteen and I was thinking of maybe 2 of my closest friends & I could go for makeovers after school in a limo, then go pick the other 8 girls up and come back to my house. That's where I'm stuck. I don't have a theme and I don't want it to be a big party. Just something sweet and memorable! I could really use some tips in the next week because I need to have it planned by the beginning week of February. Congrats on your Sweet 16! When my daughter turned 16, she borrowed a karaoke machine and CDs, and everybody had a great time. Since you will be made up, you might want to set up a photo studio at your house, and take glamor shots of each girl. Have fun!